The Philips 83C752/87C752 offers many of the advantages of the 80C51 architecture in a small package and at low cost. 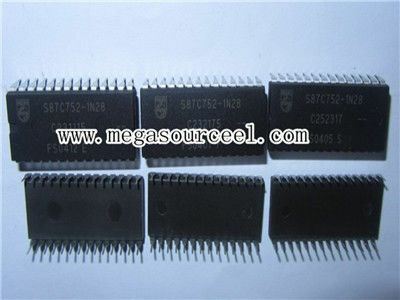 The 8XC752 Microcontroller is fabricated with Philips high-density CMOS technology. Philips epitaxial substrate minimizes CMOS latch-up sensitivity. 64 × 8 RAM, 21 I/O lines, a 16-bit auto-reload counter/timer, a fixed-priority level interrupt structure, a bidirectional inter-integrated circuit (I2C) serial bus interface, an on-chip oscillator, a five channe multiplexed 8-bit A/D converter, and an 8-bit PWM output. 8XC752 to operate as a master or slave device on the I2C small area network. This capability facilitates I/O and RAM expansion, access to EEPROM, processor-to-processor communication, and efficient interface to a wide variety of dedicated I2C peripherals. The EPROM version of this device, the 87C752, is available in both quartz-lid erasable and plastic one-time programmable (OTP) packages. Once the array has been programmed, it is functionally equivalent to the masked ROM 83C752. Thus, unless explicitly stated otherwise, all references made to the 83C752 apply equally to the 87C752. The 83C752 supports two power reduction modes of operation referred to as the idle mode and the power-down mode. 1. We will offer pictures to our customers first and arrange shipment immediately after they make a confirmation. To protect your interest, please make sure to carefully review the pictures to ensure that model, suffix, packaging, appearance, etc. can meet your requirements before our sales team effect shipment. We don’t accept any return of goods due to the above reasons of uncertainty. 2. We have the most direct supply channels with manufacturers, supplier agents working closely so as to reduce product circulation. We are strict with quality, inspection and testing as they our essential work. At the same time,we also provide thoughtful, multi-faceted and comprehensive after-sales service.